Puri: BJP president Amit Shah on Sunday launched a vociferous attack on the Naveen Patnaik government here, accusing it of neglecting the state’s development, ignoring the Tribals plight and refusing to accept the Centre’s Ayushamman Bharat programme which would have helped the poor within and outside the state get medical benefits. Invoking the Odia pride, he asked the voters to elect a chief minister in the coming elections who can understand and speak language. He claimed that Naveen is failing to understand the pain of the poor people because of his perceived lack of command over Odia. He alleged that both BJD and Congress were two sides of the same coin and one is B team of the other. Both these parties ignored Odisha’s development during their respective long tenures and the Tribals have been the worst sufferers, he alleged. “I feel ashamed of the CM when a tribal like Dana Majhi had to carry his wife’s body on shoulder for 12 kms back to his village. Such CM’s should be thrown out of power,” Shah said referring to the infamous incident in Kalahandi in August 216 which shook the consciousness of the nation. 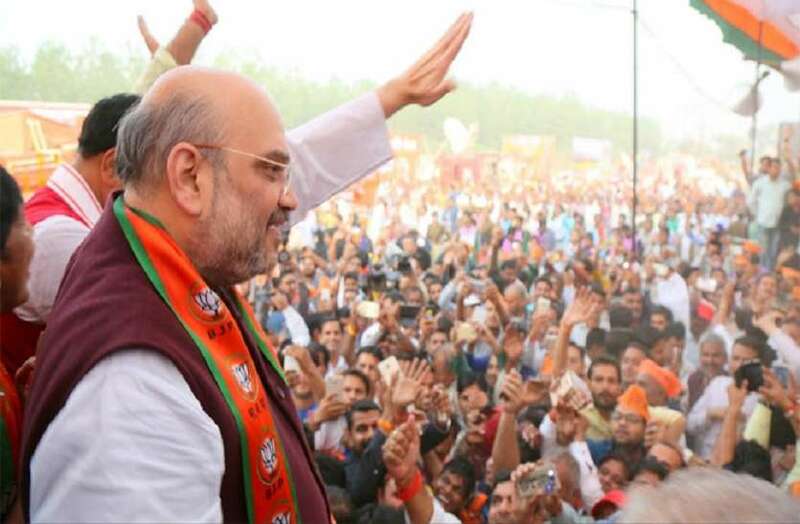 Shah’s vitriolic attack against the CM came barely four days after he had slammed his government in a similar fashion at a rally in Naili, Cuttack. Going all out against the CM at the Puri rally where he had come to participate in the Adivasi Adhikar Samabesh, Shah raked up the State Government’s refusal to adopt the Ayushmaan Bharat scheme, asking the people to raise their voice against this “injustice”. “Elections are three months away. I once again request Naveen Patnaik to accept the scheme or else the voters will throw you out of power,” the BJP president said. Shah claimed that the State government has failed to utilise Rs 5.13 lakh crore of the central assistance earmarked by the Modi government since it came to power. The Centre, he said has announced 129 schemes for the welfare of poor, countering BJD’s allegations that the Modi government had done little to alleviate the sufferings of the marginalised sections of the society. Listing out initiatives launched by the Modi government for the tribals, Shah also referred to the budget announcement of direct cash transfer of Rs 6000 per year to the farmers. “In 10 years, UPA claimed to have waived off loans of farmers worth Rs 57,000 crore for three crore farmers only. However, in the recent budget, we plan to spent Rs 75,000 crore, benefitting 12 crore farmers,” he said. Taking a dig at Congress president Rahul Gandhi, Shah said that while the entire House was cheering the announcement for farmer, Rahul looked downcast, which showed he had little concern for the farming community.